Wendy Pelligrino, Founder of Angel's Circle in Staten Island, New York. "The Circle started on September 11th. When the whole thing happened I was just so frightened that I started running around my community. I tied red white and blue ribbons on every tree. It was 3 am in the morning and I couldn't sleep at all. This triangle was just empty property here. So, I made a sign that said "God Bless Our Heroes" and I put it right in front with two candles on each side. Then later I bought 16 flags and put them down. Then my neighbor put a photo of a firefighter who he knew when he was young next to mine. 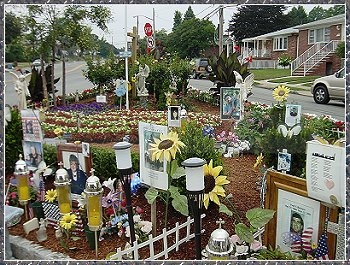 Later I sent a letter to the SI Advance saying that this property would be wonderful for a permanent memorial. They published the letter. Little by little, day by day, I would come out and there was another picture. Then I realized what this was going to be. I was so happy because now we are keeping their spirits alive. Please come and visit us. Take the first exit after you cross over the Verrazano Bridge then make the first left turn. Cross over the expressway, pass the light and keep going a few blocks. You will see Angel's Circle on the right side. Thank you for caring and for sharing your love.